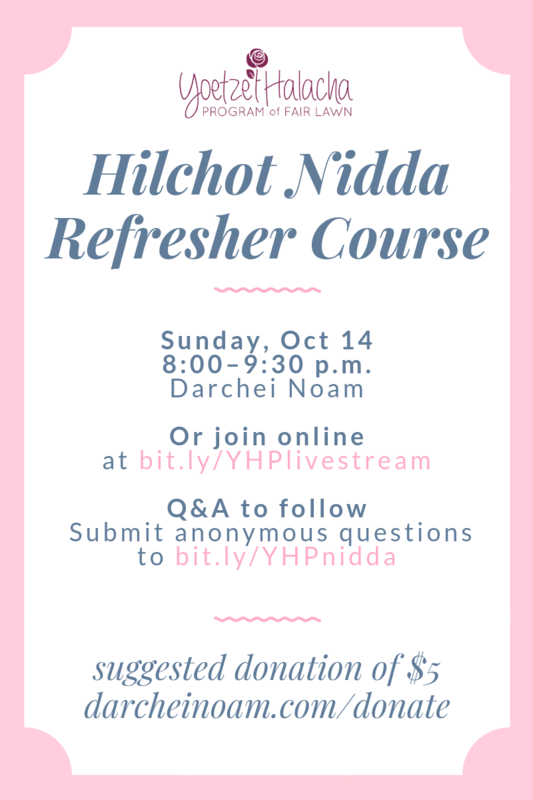 Yoetzet Shira Donath will be offering a 1-night refresher course on hilchot nidda on Sunday, Oct 14, 8:00–9:30 p.m at Darchei Noam or online (details below). The class will be followed by a question and answer session. To submit questions anonymously, go to https://bit.ly/YHPnidda. Participants can join in person at Darchei Noam, or online at https://bit.ly/YHPlivestream. To download the source sheet click here. Suggested donation of $5 to participate, darcheinoam.com/donate.